Joshua Da Silva (left) from Queen’s Park II receives an award from Anil Kamal at the Trinidad and Tobago Cricket Board’s 61st annual presentation function, at the National Cycling Velodrome, Couva on Saturday. 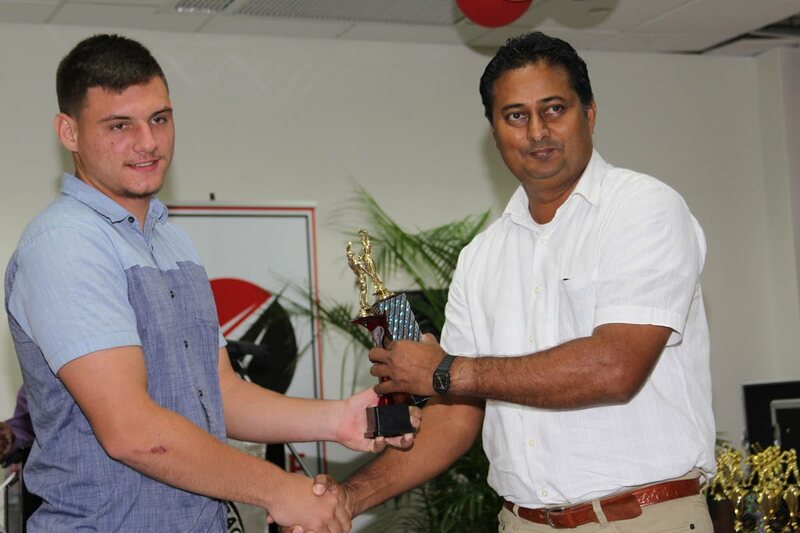 The Trinidad and Tobago Cricket Board (TTCB) held the National League Individual Awards Presentation for 2016 and 2017 – “Part One” of its 61st Annual Presentation Function, at the National Cycling Velodrome, Couva, on Saturday night. The first aspect of the ceremony saw the distribution of awards for the 2016 season followed by the 2017 awards for individual performances. “Part Two” of the ceremony is carded for next month. Trophies were given to batsmen who made centuries, during the season, as well as bowlers managing to claim 10 wickets or more in a match. Each zone in the Championship Division were separated into three categories and the prizes were distributed to the top South, North/Central and East/North East cricketers. The Premiership had two divisions (I and II) as trophies were also given, based on the same criteria, to the top performers. The 2017 Premiership Division I saw Queen’s Park I batsman, Tion Webster, receiving a trophy for his unbeaten 172 runs against Powergen Penal Sports Club in the 50-over competition. One of the standout bowlers during the past season was Merry Boys’ Ricky Jaipaul for his 12 wickets for 60 runs during a league match verses Tableland. In the Premiership Division II, Queen’s Park II also received an award through Johnathan Augustus’ 179 runs against Orangefield. Orangefield’s Derone Davis not only secured his trophy after claiming 11 wickets for 77 runs versus Diamond, but also managed to take 11 wickets for 77 runs against HKL Aranjuez. The 2017 Championship Division East/North East category witnessed El Socorro Youth Movement’s Deepak Kumar smashing 155 not out, against UWI, to claim his trophy while his clubmate, Selvyn Jacobs, took 10 wickets for 111 runs versus Fulham. In the North/Central group, Calcutta’s Vedesh Maraj found himself collecting a trophy for his unbeaten 146 runs in the league against Santa Cruz. Preysal’s Ryan Austin snatched his trophy when he got 11 wickets for 50 runs versus Couva Sports. In South, MYO’s David Latchaya 176 runs against Yorkshire saw him becoming eligible to collect a trophy on the night. Some 2016 standout awardees were Powergen’s Royston Crandon with the bat when he smashed 166 runs on the Comets during the Premiership Division I. Crandon’s club-mate, Kavesh Kantasngh, collected an award with his 11 wickets for 100 runs against Tableland. Moosai’s Rakesh Seecharan also got a bowling award when he captured his 11 wickets for 49 runs versus Esmeralda in the Premiership Division II. Central Sports’ Kamil Pooran’s knock of 169 run not out against Calcutta, made way for him to collect an award. However he made it certain after his 119 runs facing the same team in a 50-over match. In the Championship Division, Yorkshire’s Andrew Dennis scored his century against Progressive when he smashed 152 runs. The zone’s top bowler was Evergreen’s Arvind Ramlogan as he had a 10-wicket haul for 128 runs against Diamond United. The East/North East Zone witnessed UTT’s Brandon Narinesingh defeating Fulham with his 155 runs in the league while his teammate Keyron Ramlal secured 11 wickets for 45 runs in the same match to claim his award. In the 2016 South Championship Divison, Amir Khan of Police took 10 wickets for 90 runs when he faced Santa Cruz in the league and Ryan Ramasray representing the El Socorro Youth Movement also snatched an award for his 150 versus Defence Force in the 50 over match. Reply to "Webster, Jaipaul claim silverware at TTCB Awards"